I have had the honor of providing a variety of professional development and trainings for teachers over the past few years. I love that I get to combine two of my passions: education and leadership. But I noticed something a bit frustrating the first time I delivered any kind of training to teachers….It’s much easier to teach children than adults. I was an elementary teacher and I could usually maintain good classroom management just through engaging content and the good ‘ole “teacher look”. My students respected my authority as their teacher, and generally enjoyed coming to school. Teachers need to embrace learning. That doesn’t mean you automatically buy into whatever someone is trying to teach you, but it means be open-minded to those whose purpose is to help you. Learners (in this case, teachers) need to be respectful to coaches/trainers in the way they expect from students in their own classrooms. Teachers need to pause and think about why a student might be acting out, withdrawing, or being negative in their own classes and try to rectify it in the name of learning. Are you a lifelong learner? We tout that phrase in education. And learning can look differently for every person (ahem, plea for differentiation in the classroom here). But, we need to seek out learning that we are personally passionate about, and realize that, at times, we will be forced to attend a training our district requires. Go with a good attitude. It will be more enjoyable and beneficial for all involved. 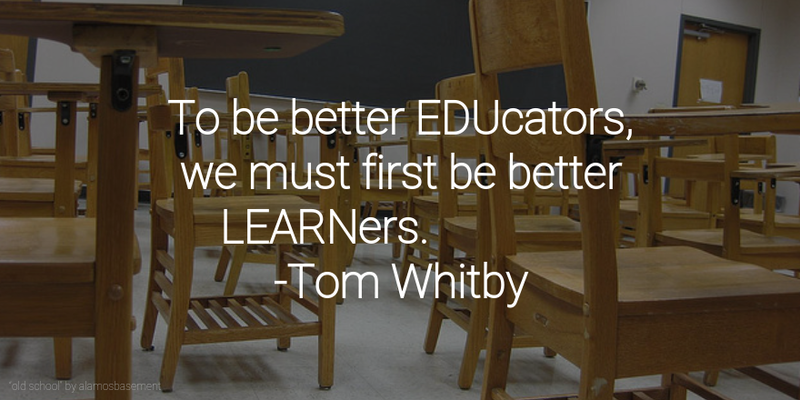 Be the learner you want your students to be.